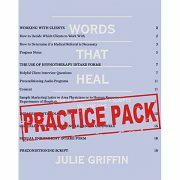 If you are actively launching a clinical or medical hypnotism practice or if you want to improve your existing practice, the marketing products and licensed script included in the Words That Heal Practice Package will help streamline your efforts. A fully licensed preconditioning hypnosis script entitled: Hypnosis for Happiness, Health & Self-Esteem. You may freely use this preconditioning script to create audio productions for sale to the public or as a marketing tool that will prove to your clients that they are capable of fully enjoying being hypnotized by you. Even though this is a complete self-hypnosis experience, we recommend that you consider it as a give-away item that you send to prospective clients. Your great hypnosis voice combined with Griffin’s words will aptly demonstrate to your client the power and pleasure of hypnosis! A copy of a professional hypnotism brochure Griffin used in her own practice. Originally designed as a tri-fold brochure it explains hypnosis to the client and answers many of the most commonly asked questions about hypnosis. You are free to edit it, convert it to other formats, and use it as you see fit in your practice. A sample letter marketing your services to physicians and the medical community, that you can use as your own and print on professional letterhead. An overview of the process of obtaining client consent and referrals, including templates you can use to create your own consent and referral forms. A copy of a medical hypnotherapy intake form that helps you to fully understand the needs and condition of your client. This form will help to ideally orchestrate the management of your client’s sessions. It will enable you to be prepared to perform masterfully during your client’s very first visit to your office.